that’s pronounced N-eeeps and Tat- tees. Got it? Neeps and what I hear you cry? Actually, they’re a fun and incredibly comforting and delicious way to serve root vegtables. Very fitting for these Winter nights (um, if we ever have a winter that is…) So, the neeps is Scots slang for parsnips…neeps, nips, get it? And the tatties are the beloved po-tat-o. So here’s the thing…Scots-Irish folks love to mash their root vegetables and when freshly dug from the earth, boiled, seasoned and mashed, there are few more simple pleasures than these. A true comfort food that suits the colder climates in Scotland and Northern Ireland, this simple pairing will never-the-less work as a cold comfort in Appalachia also. Serve the Neeps’n Tatties mashed side by side either on their own, or as a side dish. Enjoy. 1. 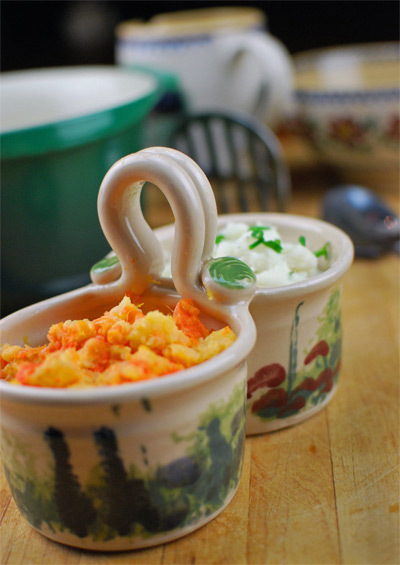 Prepare the turnip and carrots then cut into small even pieces. 2. Place the turnip in a pot of cold water and bring to the boil. 3. Cook for 10 minutes before adding the carrots. 1. Cook the vegetables together for a further 20-25 minutes until tender when pierced with a fork. 2. Drain the vegetables and mash them together. 3. Gently heat the milk and butter together, incorporate liquid with the vegetables and stir in the parsley, nutmeg, salt and pepper. 1. Prepare the potatoes and place in pot of cold water. 2. Bring to the boil and cook for 15-20 minutes until tender when pierced with a fork. 3. Drain and dry out by placing the potatoes in metal colander over a saucepan, allowing the heat to gently dry and steam them. 4. Warm the milk and add the butter. 5. Mash potatoes and add wet ingredients. 6. Stir in the chives, salt and pepper. January 25th is Burns Night, and to most, the Scots poet Robert Burns is a complete unknown and Burns Night a complete mystery. Yet, every New Years Eve we all link arms and mumble the words to ‘Auld Lang Syne’, do we not?’ Of course we do , and if you’re like most people, you don’t actually know the lyrics to Auld Lang Syne beyond “should old acquaintance be forgot”, etc but did you know that in the midst of your New Year frivolities you were are in fact reciting the words of Scotland’s most notable poet? Yes, ’tis he of the tartan lands, the Scottish Shakespeare, the notable Robert Burns. More famous than a blue painted Mel Gibson in a skirt with a sword! Yes indeed, ‘tis the Bard himself, and every January 25th in pubs and clubs across the land Burns night suppers are held in his honor. So, what’s this all about again? 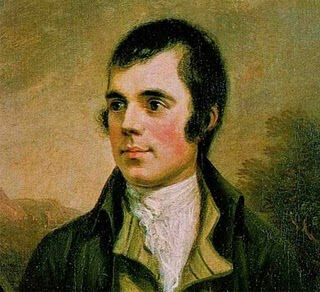 Actually, joking aside, the Scots poet Robert Burns is a big deal inScotlandandNorthern Irelandand as such I thought it very fitting to write a wee blog in his honor and then follow up with a wee recipe that hails fromScotlandto warm us all up on these cold and wet winter nights. And who is he, this Burns guy? Well, our wee Robert Burns is a hero who lived in the 18th century and is regarded as Scotland’s favorite son. (Think of what Thomas Jefferson means to America, get it?) He is regarded as a pioneer of the Romantic movement, and after his death he became a great source of inspiration to the founders of both liberalism and socialism and a cultural icon in Scotland and among the Scottish Diaspora around the world. And so, every year we dress up, eat haggis, sing songs and have a great ‘ol time being Scottish, even if you’re not! This year I’m actually celebrating the event by being a guest chef contributing to the Burn’s supper event at my local Irish pub, Olde Blinde Dog in Milton GA. Should be good craic as we say, and I may even sell a few more copies of the Shamrock and Peach! So that’s your cultural lesson for this month, and tune in later this week as I’ll follow up Burns night with a really nice, truly Scottish recipe that is comfort food for cold nights! 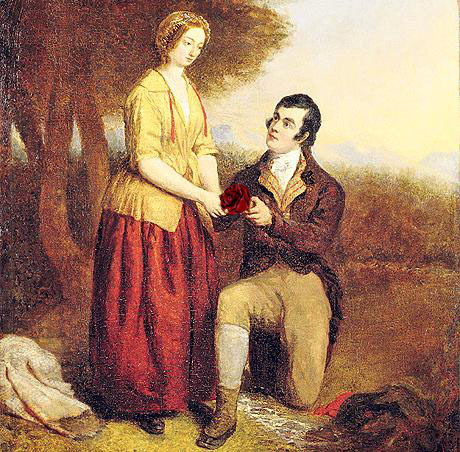 So, I’ll leave you with our romantic Robbie burns and a verse of one of his famous poems I love….aaahhh. So, tune in next time for Burns night part two!